As with most other Flash Drives you are not going to get a box with the DT Elite. You will get a small package that is suitable to hang on a peg in a store, which is not bad as there is not much to go along with the DT Elite. There is also not that much to damage in shipping so having the light packaging is not a bad thing at all. 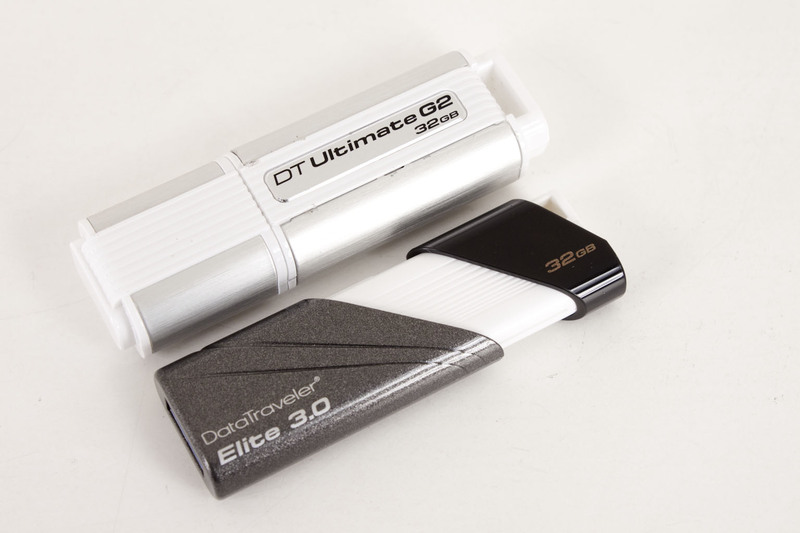 The DataTraveler Elite is a fairly nice looking USB flash drive. It has a sort of fancy look to it that is eye appealing. However all of that seems to end when you pick it up. One of the people we had play with the DT Elite made the comment that it looked nice, but felt cheap. It is light and the outer shell is plastic which combine to give it that feel. At the business end (there the USB 3.0 plug is) Kingston gave the DT Elite a retractable cover that slides back to reveal the USB 3.0 plug. This area has been given something of a granite look with the grey background and silver speckles. 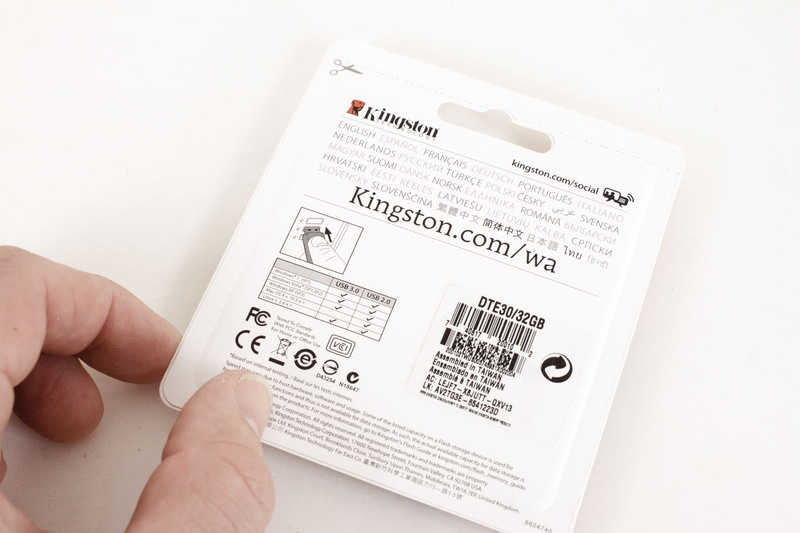 The product name is on the lower corner of the slide while the capacity is at the back end on a black flange that is intended to stop the sliding cover. There is also an eye for a leash to be attached here (there is a basic one included in the packaging). It is a functional design, but not necessarily the best one we have played with. It is the same length as the older 32GB DT Ultimate, but is about half as thick. This will make the device easier to carry around and also means that instead of having four 4GB NAND Flash chips we are more likely seeing two 16GB chips here. 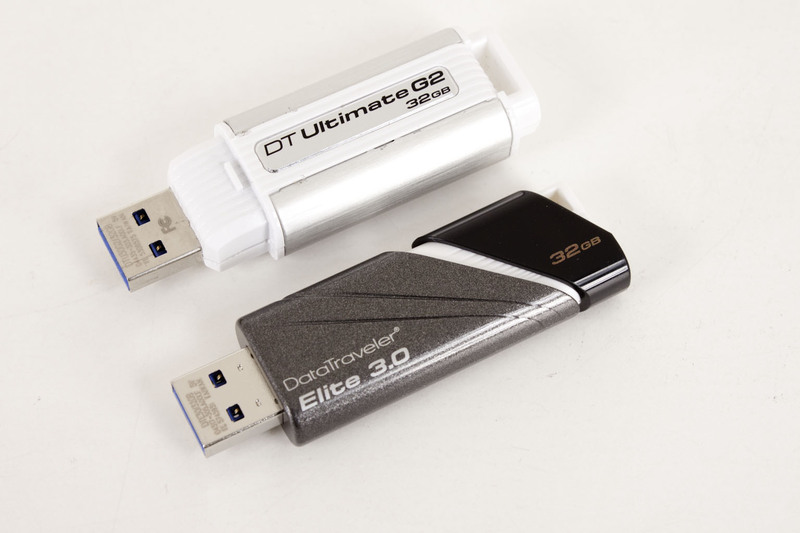 We are imagining the controller in the DT Elite is also the same as the one used in the DT Ultimate (The Phison PS225-01-L) This is a very nice USB 3.0 controller and one that is sure to give us some good performance numbers when run on a decent USB 3.0 controller on your motherboard. Testing the performance of a drive of any type is a pain. 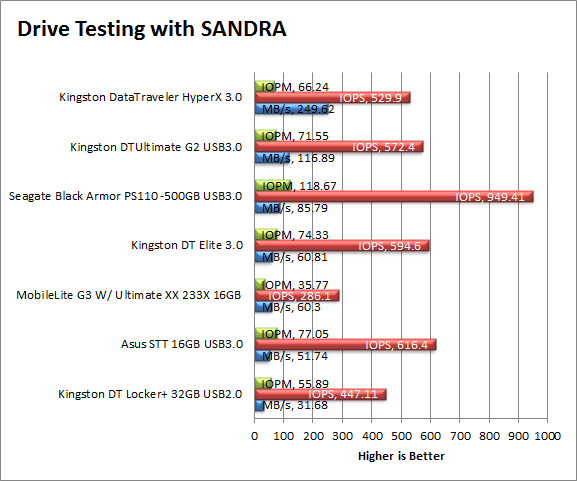 Sure you can get repeatable numbers using a few of the more readily available testing utilities; Sisoft’s SANDRA, HD Tune, PCMark7’s Storage Suite, AIDA64, and others. SANDRA came back with a score of 61MB/s this puts us a little behind the stated 70MB/s read speeds on the front of the package. Still it is not far enough to be all that concerned. You should not have any issues with reading your data off of this drive when you need to. AIDA64 confirms the 61MB/s read speeds that SANDRA gave us. We are also seeing that the drive has issues with linear reads from the middle clusters of the drives formatting. This is becoming more common with flash dives as we see read performance at the beginning and end of the drive increase the middle suffers. 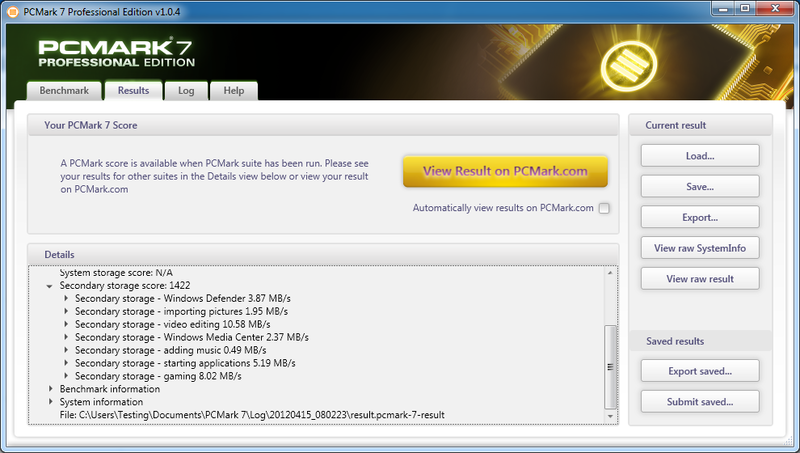 The DT Elite managed to pull off a 1422 PCMark07 Storage score with some fairly decent general access times. The best performance was during the Video Editing test at 10.58MB/s while the worst performance fell to 0.49MB/s during the music add test. Basically you would not want to use this as a primary drive for something like Windows 7. 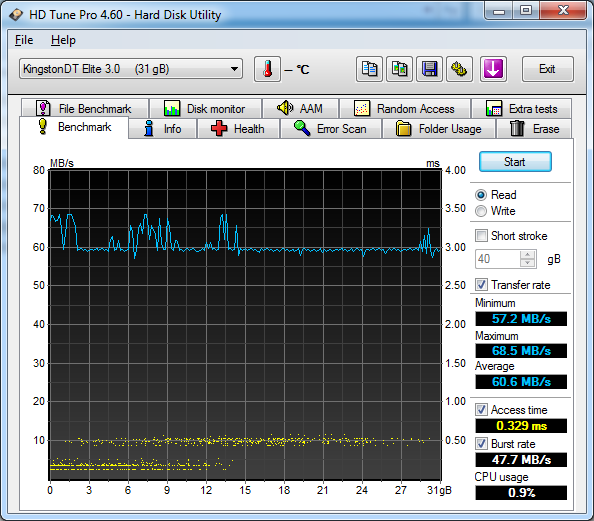 HDTune really backs up the rest of the performance numbers here which gives us our final speed estimate on the DT Elite; 61MB/s. This is not bad and certainly mush faster than any of the USB 2.0 keys we have (they max out at around 32MB/s). 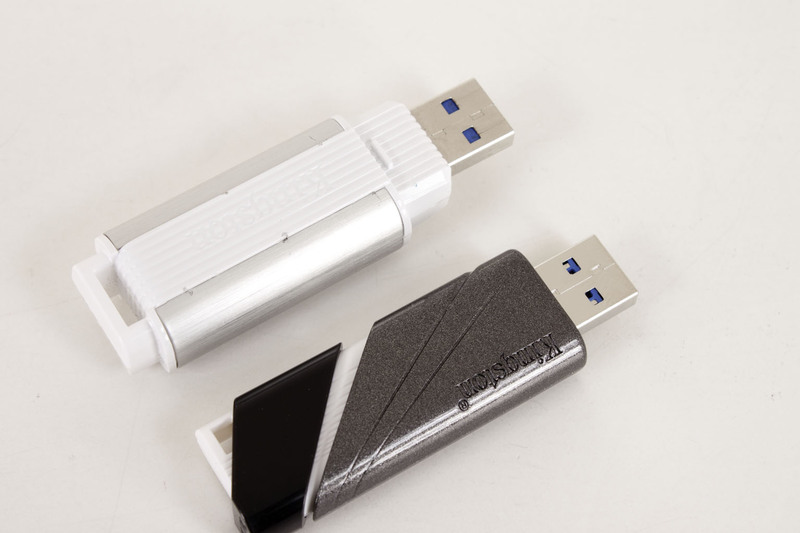 As we mentioned before there is a move to making the most of how cheap flash drives have become. Although we showed you the SurfEasy (which is a USB key with a portable browser and a proxy service), many are not going to be interested in that because their data still goes through someone else’s servers (and they stated they will cooperate with law enforcement). So what has been happening is an increased use of tools like the Tor Browser package. You take this and drop it on a USB key and you get secure (fairly) anonymous browsing where ever you go. You can also drop in an OS and use this for a live OS key. We tested the DT Elite with both of these in mind and had no problem with it at all. Running the Tor Browser the DT Elite was smooth and more than able to keep up with the requests we made of it (although the TOR network is not the fastest). When we just ran FireFox portable our internet speed up quite a bit, but we did not have the advantage of anonymity any more as we were not using any proxies. Still overall the DT Elite has some solid performance. It is not top dog for sure , but you will get some nice read numbers when you are trying to access your files. Value is another very subjective topic. What is expensive to some might be a deal to others. You can look at this topic in multiple ways. One is raw price and the other is what you get for the money. Each is accurate and both are correct ways to look at price/value. We tend to look at features, performance and real-property when we discuss value. However, we also take into account the raw cash cost of the item. 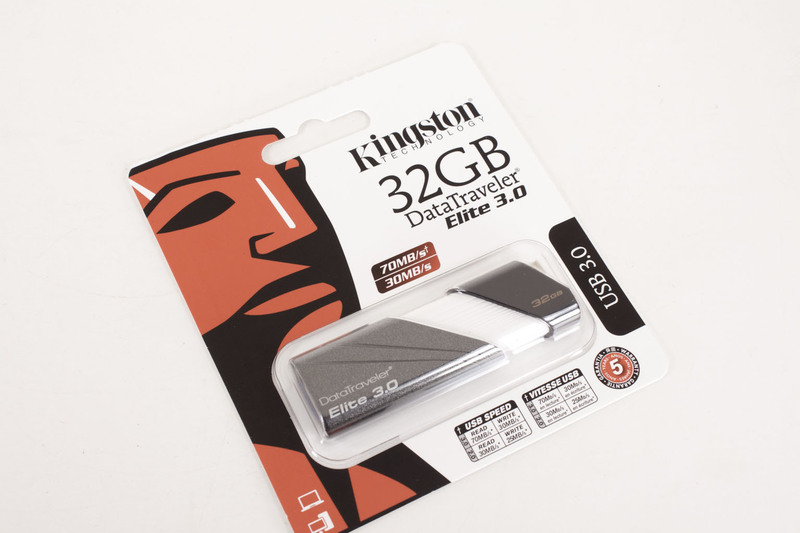 The 32GB DT elite will set you back about $78 is you get it from Kingston directly. We checked around and were not able to find it on Newegg, but did find it on a few other sites that had the 32GB flavor for as little as $46. The 16GB variety runs for less and can be had for around 25 while the 64GB model will push things close to $100 in many cases. 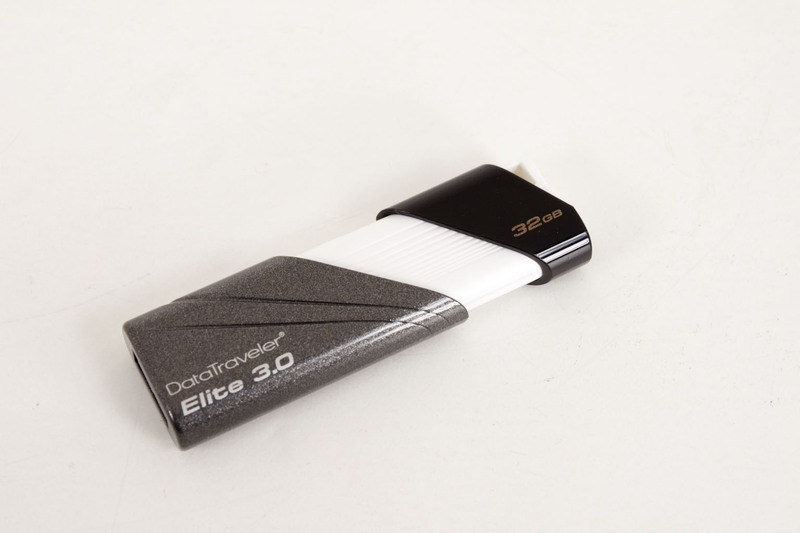 At $46 the Kingston DataTraveler Elite 3.0 32GB USB Flash Drive is not a bad deal. It is not as fast as we would like it to have been, but it is still faster than any of the USB 2.0 drives that we have tinkered with. The capacity at 32GB is very nice giving you lots of room to store files on. You will not be able to push any single files over 2GB is size though as 2GB is the max file size limit with the FAT 32 file system. Still you can always reformat the drive as NTFS and get around that. For a small portable storage device the DT Elite is great, as a potential portable privacy product (with portable versions of TOR, FireFox Messenger and more) it is even better.